Grits. 12″ x 12: watercolor pencil on paper. Sharyn Dimmick. My pal Lisa, who has taught you (or tried to teach you) how to make cornbread, caramel cake and shrimp and grits, kindly sent me a care package of Southern specialties to enhance Work With What You Got month here at The Kale Chronicles: now I’ve got two pounds of stone-ground grits from Charleston, South Carolina, a bag of whole pecans, and a bag of pecan pieces, straight from Georgia. I have my eye on a pecan pie and a batch of pecan rolls as soon as we remember to replenish our supply of yeast, but I thought I would start out by making grits for breakfast so that I could really taste the stone-ground goodness of these particular grits. The lovely cloth bag they came in said I would need to cook the grits for twenty-five or thirty minutes. No problem. What it didn’t say was to allow ten minutes to get the plastic gizmo off the top of the bag so that I could get to the grits inside: ten minutes with two knives is what it took — I’ll have to ask Lisa how she pries hers off. Anyway, there were two recipes printed right there on the bag. One said I could cook my grits in water. The other said I could cook them in a mixture of milk, water and cream. Since I knew it was obligatory to eat them with butter I took the middle way, rinsed them with water, as instructed, and then cooked 1/3 cup grits in one cup of milk with a little salt. It probably did take twenty-five minutes to cook them: they got nice and thick and creamy, smelling faintly of corn. Now, I ate grits when I lived in Chapel Hill, North Carolina. The Kroger there had at least half an aisle devoted to grits: instant grits, quick grits, big boxes of grits, little boxes of grits. I had never seen so many grits in my life and I had never eaten them before. While I lived there we made a field trip to Columbia, South Carolina, and saw a film about grits. The filmmakers asked people what they ate on their grits. Most people said they ate them with butter, salt, salt and pepper. A few ate them with Tabasco sauce, but one memorable woman said she ate hers with peanut butter and chow-chow. I’ll leave it to Lisa to explain what chow-chow is — that I have never eaten — it’s some kind of Southern pickle. My stay in Chapel Hill branded me as a Yankee, even though I am a Westerner. I did not know that the Civil War or The War Between the States was called “The War of Northern Aggression” until my roommate informed me otherwise. People used to ask test questions at gatherings. One of the questions was, “Do you want biscuits with your eggs, or grits?” Yankees choose biscuits, toast, anything but the mild, creamy pile of grits on the breakfast plate. Anyway, all I added to my hot, creamy bowl of stone-ground grits was the traditional pat of butter. With butter, salt and the milk they were cooked in the grits were faintly sweet, tasting slightly of corn. I found them to be a thoroughly unobjectionable breakfast cereal. They have more character than Cream of Wheat and not the heft of oatmeal. I’ll fix them again soon for Johnny because he likes them and then I will branch out into cheese grits or start throwing contraband ingredients in, such as dried apples. I have a mind to make Lisa’s Shrimp and Grits, too, as soon as I can find Gulf shrimp or something wild-caught here: we don’t like to think about farmed shrimp coming from Thailand when we live right here on the coast. Stay tuned for pecan pastries and desserts. Measure 1/3 cup stone-ground grits. Film a saucepan with water. Put the grits in the saucepan until just covered with water* and then carefully pour the water off without pouring the grits down the sink. Add to the grits pan 1 cup of milk (I used 1%) and salt to taste. Bring the grits and milk to a full boil and then reduce the heat enough to keep them at a simmer. Stir periodically with a wooden spoon until the grits are thick and creamy. Transfer the grits to a cereal bowl, add a pat of butter, stir and dig in. This recipe serves one, for the grits fan in your house. If you make it for two, each person gets his or her own pat of butter. Food Notes: the better quality grits you start with the better this breakfast is going to be. Lisa sent me the good stuff. I don’t vouch for what you will get if you use instant grits or quick grits, but I am not a fan of instant oatmeal or quick oats as a breakfast cereal either: usually the texture is better in the old-fashioned, less-processed forms of grains and cereals. I use a sharp knife or my kitchen scissors to cut the plastic tie on my bag of Charleston Favorites. I love the bag. If I am having bacon and eggs, I make them with water; otherwise, I prefer the creamy version but with less butter. Trader Joe’s usually has wild caught blue shrimp at a reasonable price–even the one in CT (that’s right–one). As for the Northern Aggression, I attended third grade in Charleston, SC. I thought that the South had won the war, but then decided to rejoin the Union. Needless to say, fourth grade in CA was a bit difficult for this brainwashed Yankee. Ah, I had no idea that you ate grits and that you purchased Charleston Favorites (good, huh?). I don’t think I knew you had lived in the South either (it doesn’t show), but you had to learn to eat grits somewhere. I tried grits about 16 years ago when I was down in Atlanta on Business. I did not care for them, sorry. Many people do not care for grits, Eva, and others love them — loving them I do not understand, but I did not grow up eating them. I like them and find that, like with anything else, the better quality food you start with the better the result is. Cheese grits are the best, and I have a recipe for something called surprise grits made with gruyere that are cooked, then cut into slices like polenta and then baked and are out of this world! I once knew some kids that ate their grits with butter and sugar…much like cream of wheat, but it always looked kind of gross to me. In fact, the very first post on my blog was about red speckled grits. http://bitsandbreadcrumbs.com/2011/06/15/ode-to-red-speckled-grits/ But I digress. What a great friend you have to send you such wonderful goodies! And chow chow, when it is traditionally made, would be a relish, almost like a southern kimchi, but can be made mild or hot. There’s also a green tomato chow chow that is wonderful with veggies or meat. Thanks for the red speckled grits link, Betsy. Now I want to try them too (Maybe next year). Yes, Lisa was sweet to send me Southern specialties. I’ve seen chow chow (in the film) but I have never eaten it. It’s a pleasure to send the best of the South (grits and pecans, of course) out you, Sharyn. I can’t wait to see what else you are going to prepare. In my family we did not eat chow-chow, and until I moved from South Georgia to North Georgia (these are truly two different cultures), I’d never heard of such. We did eat pickled watermelon rind, though, and boiled peanuts, and pot-likker! I made grits for Johnny this morning, Lisa. He said they were really good. Coffee and grits — now that’s a Southern breakfast. He mentioned gravy and I told him he was out of luck. Then he said he’d never eaten grits with gravy, just heard about it. Love to hear that Johnny liked your grits! Tell Johnny I have never seen anyone in my home state eat gravy with grits…gravy with biscuits, yes. Most of all we eat grits with real butter, salt and pepper. I add cheese and cream to mine to make them stick to my ribs. We have a tomato gravy recipe in the family that is quite tasty and unique. See if Johnny wants to give that a try and I’ll get the recipe from my mother. Thank you, Smidge. We ate them again this morning the same way, cooked in milk with a little salt and topped with a pat of butter. Thank you, Debra. I don’t know whether it will be maple-pecan pie first, or pecan rolls — it depends on when I get yeast. Em r grits, now. When I lived in the south grits were literally found on my plate more often than those darn large flying cockroaches. At first I approached them with trepidation but found after a while I really enjoyed them. Anything with pecans, in my estimation, has got to be good. I agree with you about the delectability of pecans, Sue. I have never had grits, but as I read I wondered about adding dried fruit and you have confirmed that this is indeed a choice. Your story about NC reminds me of my honey and I standing out like sore thumbs in Scotland because of how we held our knife and fork in the pubs where we ate. Driving is not the only thing that is reversed over there (or over here). Is there a theme to November? As I said to Smidge earlier today, I’ll know on Sunday if there is a November theme. It is definitely not traditional to add dried fruit to grits, but since I did not grow up eating them I can plead ignorance. It is traditional to make baked grits casseroles with lots of cheese — maybe Lisa Knighton will confirm this. As a Southerner from Georgia, I have never seen fruit in grits. But why not!? Eat ’em any way you like. Traditionally, we don’t put anything but butter, salt, and pepper in the grits. 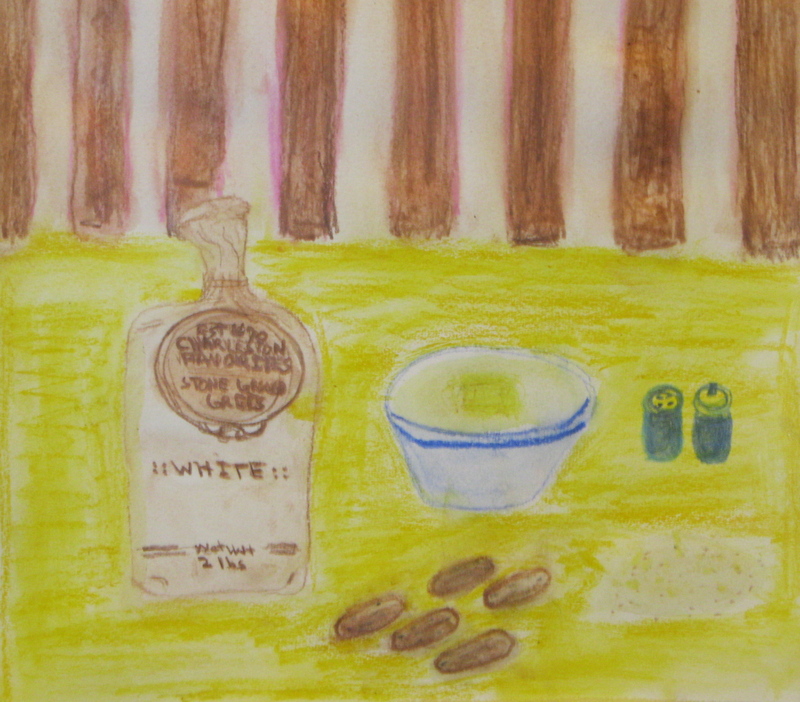 Most mornings we simply had the grits with scrambled eggs and white toast with homemade fig preserves. What a lovely food parcel! Never knowingly eaten grits, but do like a teeny slice of pecan pie! It is such fun to get a package, isn’t it? Mom turns up her nose at grits, but Johnny and I like them. She won’t object to pecan pie and pecan rolls though. Sounds yummy. I’ve never had grits before, but the other day I made oat bran and had it with a fried egg. I imagine it’s a similar texture but a different flavor. I would probably love grits with fried egg and some salsa. Looking forward to seeing your pecan goodies. Thanks, Melissa. The pecan fest may be pre-empted for either coconut rice pudding or coconut-peanut Rice Krispie squares (now, where did I get that idea?). Stay tuned. What a kind friend Sharyn – I don’t think I ever had grits before… the name is so funny, hehe. I don’t think they sell them here – I’m really intrigued as to what they’re like.